Zainab is the youngest mehendi artist I’ve interviewed amongst all the others starting from Sumeyya, Laraib, Kiran, Namrata, Monita, Divya till Aman. She had this burning passion to create outstanding mehendi designs and decided to turn it into a full fledged business. Read on to know more about her. 1. Tell us about yourself – when did you begin applying mehendi and how did you think of getting into this line. I’m a self-taught mehendi artist from Kandy, Sri Lanka. I started applying mehendi when i was around 12 years old. Now at 17, what has always been my biggest passion, has turned out into a part time business and I love what I do! I used to sketch mehendi designs for as long as i can remember, so learning to apply mehendi was not too difficult for me. I fell into mehendi naturally as I was always intrigued by watching my cousin, Rizna apply mehendi designs for weddings and festivals. My mehendi journey has been inspired by her. Ever since i started applying mehendi, my sister has been my biggest support. I did most of my practice on her and she never refused, no matter how terrible my designs were! I don’t actually have a favorite mehendi design to be honest, it changes every few months! If I did have to choose, I’d go with the fusion of modern/contemporary and traditional designs. I enjoy experimenting with new mehendi designs. As a mehendi artist, I feel its necessary to open to all forms of art. I do not prefer to stick to the same pattern or styles, particularly I like to create my own designs using floral motifs and Indian elements like peacocks, paisleys and dots. However i consult with the bride to fully understand her requirements and I have my bridal designs pre-sketched (as I have the time and notice beforehand) to ensure the bride likes it. 3. What has been the most memorable experience you have had while doing mehendi designs – something that has stayed close to your heart and is remembered very fondly? I can’t really pick one memorable moment. Every mehendi session I’ve done so far is unforgettable and very special to me. But this Eid was very special I’d say as I continuously applied mehndi designs on loads of hands like never before! 4. What are your most important tips to take care of the mehendi after applied? Proper aftercare – use a sealant – lemon juice/sugar mixture works well, stay away from water for at least 6-8 hours. Try NOT to let your henna paste fall off prematurely (after 1-2 hours) by moving your hands excessively, dancing, etc. Always scrape off the mehendi using a butter knife or your finger nails, don’t wash! Keeping it overnight will give best results. Design will progress from orange tones to burgundy or brown over time. Color may continue to deepen even longer on some individuals depending upon their skin type. 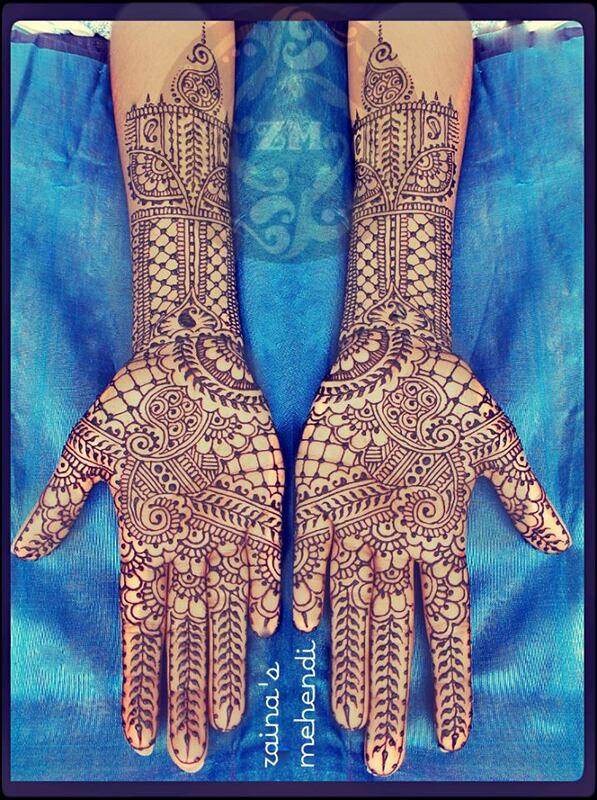 The warmer the body temperature, the faster and darker the mehendi will stain. You may reach me on Facebook or via email here. You could also follow me on Twitter. 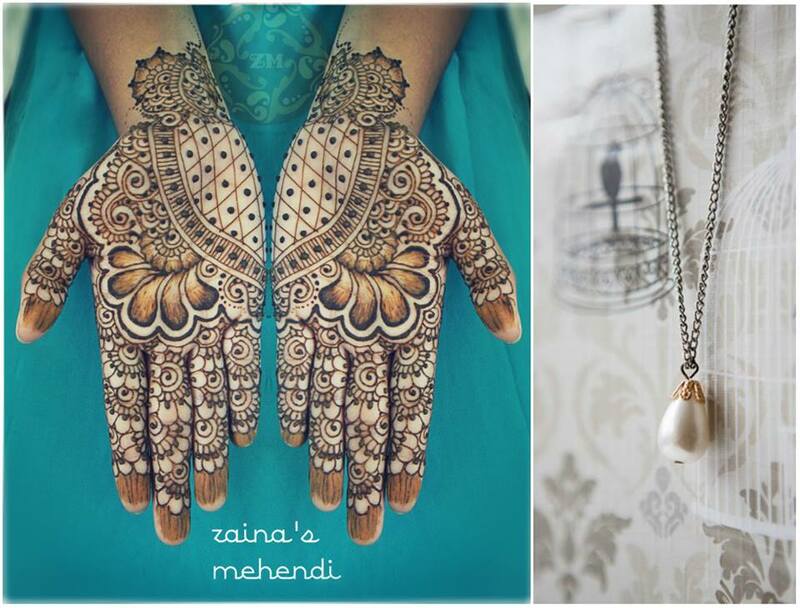 Enjoy mehendi designs by Zainab. (Published with permission of Zaina’s Mehndi (henna). Please don’t use these images without permission from the original source).